Mikias Gebremeskel stood in a public spot in Ethiopia’s capital city handing out anti-government fliers to passersby. Two police officers approached the teenager, arrested him, and then, while he sat in prison for five days, beat him with their batons. His uncle arranged to have Gebremeskel released, and in July 2014, he fled to the United States seeking political asylum. 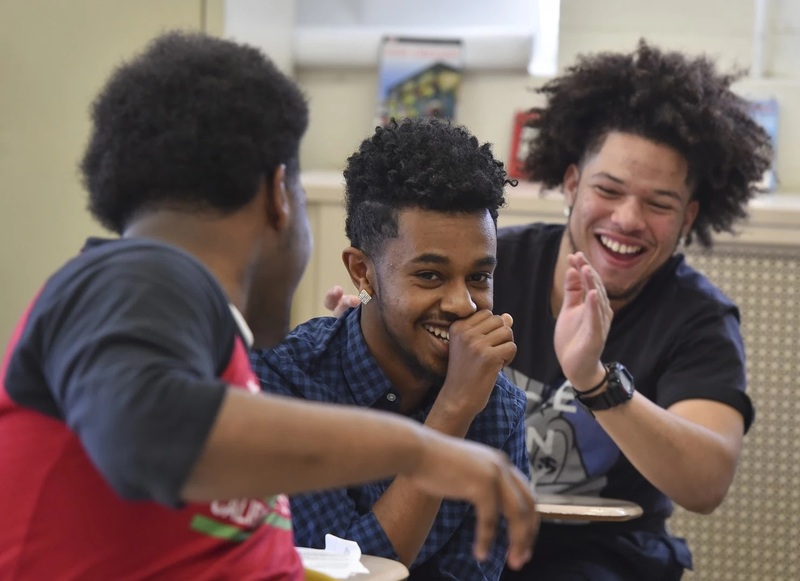 He moved to the nation’s capital, where his cousins lived, and enrolled as a junior at Roosevelt Senior High School in Petworth, one of the city’s lowest-performing high schools. Two years after his arrival here, Gebremeskel already has achieved one of the most challenging American dreams: He’ll be going to college. For free. On Thursday, George Washington University President Steven Knapp burst into Gebremeskel’s history class — with a number of school officials and the school’s mascot, George Washington, in tow — and surprised him with a full-tuition scholarship to the D.C. university, which has a sticker price of more than $50,000 a year. GWU presented 10 D.C. high school students with full rides as part of the university’s Stephen Joel Trachtenberg Scholarship Program on Thursday. Knapp, who says this is his favorite event of the year, surprised each of them at their schools. And at least a few of the high school students were dabbing their eyes as Gebremeskel learned that he would be going to college. Since the establishment of the scholarship more than 25 years ago, GWU has awarded it to more than 160 students. Ninety percent of participants graduate with a college degree, according to the university. This year, the 10 recipients included immigrants from Ethi­o­pia, Bangladesh and Guatemala, and they came from eight city schools, including Duke Ellington School of the Arts, Benjamin Banneker Academic High School, Bell Multicultural High School and Capital City Public Charter School. Gebremeskel says he applied to more than a dozen colleges and plans to enroll at GWU. In his college application essay, he said his father’s biggest dream was deferred when he was arrested before graduating from high school and that this changes everything. Nkenge Cunningham — Gebremeskel’s English teacher— said he was a standout student as soon as he arrived at Roosevelt High. During his junior year, Gebremeskel was the first student in the school’s history to score a 2 out of 5 on the Advanced Placement calculus exam. Gebremeskel said he is unsure whether he will live on campus next year. He lives in a basement apartment with his younger sister, who also attends Roosevelt and has three jobs to pay the bills. He doesn’t want to leave his sister and says he probably will stay in his apartment. His sister, Hannah, and two cousins — who are both attending college — were all there when Knapp surprised him with the scholarship. His parents still live in Ethi­o­pia and didn’t know about the event. Gebremeskel said he planned to call his parents as soon as the frenzy quieted down at school. “I can’t wait to tell them,” he said. Labels: Asylum, Ethiopia, News, Washington D.C.